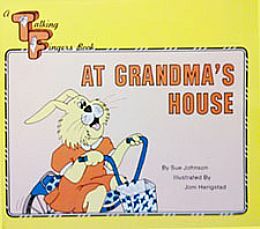 Product ID #: 204 - Ship Wt: 1 LBS..
1985, 28 pages, 9" x 8"
Pictures, signs and printed words tell the tale of April, a cuddly little rabbit who loves to play with her beloved Grandma. Uses 37-word vocabulary, includes manual alphabet and glossary of signs. See the Talking Finger Characters in the "Color, Sign and Send" Greeting Cards.